The apartment was clean and comfortable and had everything we need for a week stay. The kitchen is very well equipped including even some decent wine glasses which was a pleasant surprise. Great location that is walkable to everything in Alba. After spending the day out in the Piemonte wine country, we just parked the car in the assigned space in the locking garage and then it was an easy walk to anywhere in Alba. We would rent this again. Ciao Laura, grazie mille. Thanks! It's mt pleausure with guests like you! We stayed four nights. The apartment is very simply decorated but comfortable and clean. Washing machine and terrace to hang clothes out to dry was a plus. Not many apartments came with a parking spot in a secure garage so this was a big benefit for us as we had a car and drove all over the region. No problems at all during our stay. Laura got us settled in and was available for advice or suggestions. on our own, Apartment is in the historic section of Alba and close to all shopping and restaurants all in walking distance. La Piola was our favorite. Our favorite towns were Barolo and Neive. The Grinzane Cavour Castle was worth a visit and we saw the harvest come in in the late afternoon in Barbaresco. Thank you Laura for hosting us and we recommend this apartment for couples who have a car and want to be right in the middle of town. Grazie Mille! 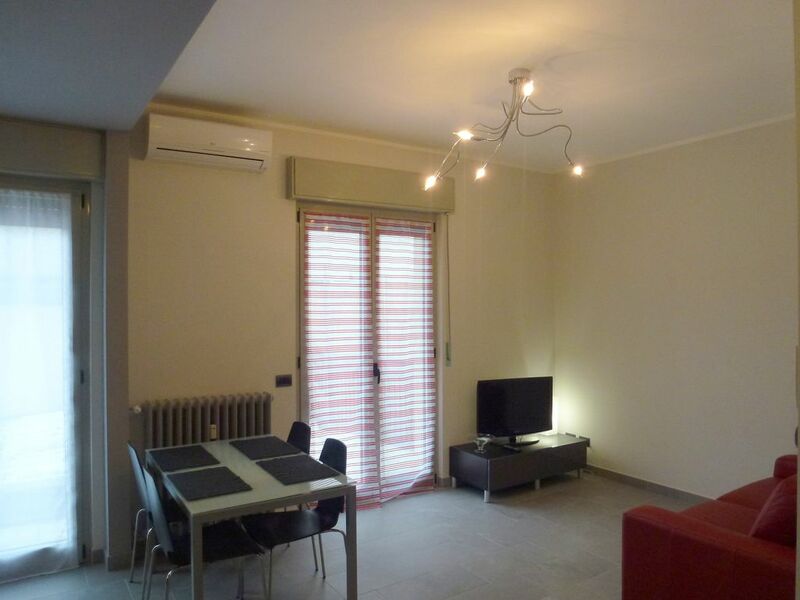 Perfectly located, clean, modern, small apartment with garage...a real find. The apartment is located on the first floor of an apartment building (modern) at the edge of the pedestrian only section of Alba. It comes with a resident garage, on the ground floor, holding about 2 dozen resident's vehicles. There is one way in and one way out, and it is very convenient to the apartment. There is a small elevator in the building, or you can climb the stairs to the first floor. The apartment consists of a kitchen/living area, a sizeable bath with shower and washer, a fairly large bedroom. There is a table and chairs, and a comfy leather sofa in the living area. The bedroom has a double armoire, a small desk and nightstands. There is a large closet containing cleaning supplies, iron, ironing board in the hall. There are tile floors, modern appliances, a sizeable fridge and a stove with an oven. Suitable for 2 people, there is also a terrace-type arrangement that opens off the living area. This was great for drying clothes (on the rack from the closet). There are no seating arrangements in this space, and it is overlooked by several other apartment balconies. The location is close to the farm market (tu, th, and Sat) and the grocery store, fashion shopping, and restaurants. I would not hesitate to rent this apartment again if staying in Alba....which by the way is a wonderful little city....clean, safe, and fun to explore. Thanks Dina! You are very nice to describe so well my apartment! I am happy to have guests like you! Hope to see again! We loved our stay in the Alba apartment. Laura was extremely friendly, informative and helpful. The location was fantastic. It was close to markets, bakeries, coffee shops and amazing restaurants. The apartment was very clean and well furnished. We enjoyed having a washer for our clothes and terrace to dry them on. One bonus for us was that it came with a large parking stall in the underground parking lot. We would definitely stay here again and would recommend it to anyone who is thinking of staying in Alba! Five stars are well earned!. Laura is a perfect host and she welcomed us and gave an introduction to the apartment and Alba. The apartment was well equiped, clean and nice in every aspect. We would gladly recommend the apartment to all who want a nice stay in Alba. A private and secure garage is another bonus! Thanks John! I really appreciate your words! My work is easy with guests like you! Alba et les collines des Langhe sont l'un des plus divers aliments et le vin de l'Italie. Ils sont également idéal pour ceux qui aiment la paix, la détente, la marche et le cyclisme. Alba est plein de restaurants et de bars à vins. En outre, de nombreux fabricants de vin sont à quelques kilomètres. A quelques miles de là aussi la maison de Slow Food ..